Did I say in the last posting that we were at the peak of the fall flowers? Well, it has been a long peak and there are still many flowers in the Valley, as well as striking displays of fruits. So, I hope you will tolerate (and maybe even enjoy) another botanically focused blog. Along the edges (and in less intensively grazed areas) bloom a profusion of white, yellow and purple flowers of the aster family. But before delving a bit deeper into the diversity of asters and their close relatives that make up the bulk of flowers at this time of the year, I would like to share some other noteworthy botanical discoveries from last week. These gorgeous deep purple berries are the fruits of pokeweed (Phytolacca americana), which grows here and there along field edges. One can be seen north of Ben Ocean’s bridge behind the school. 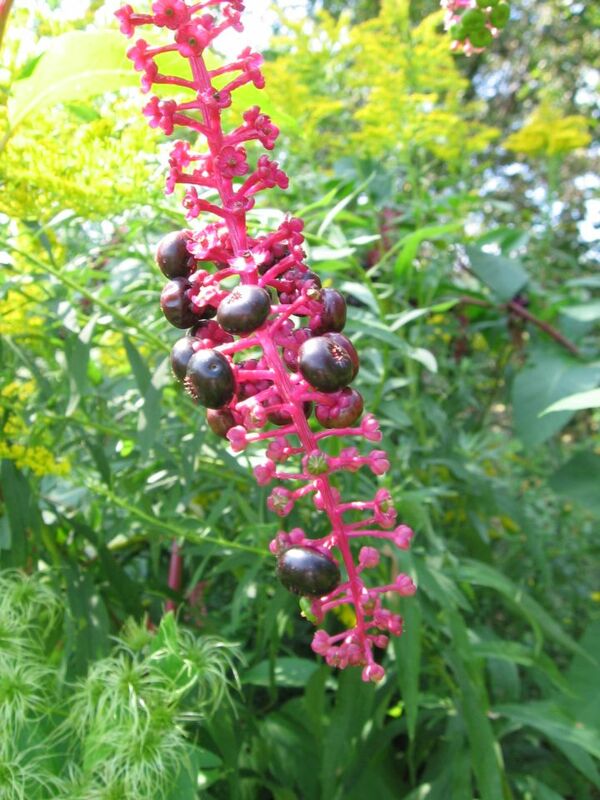 Pokeweed has dangerously poisonous roots, seeds, leaves and mature stems. However, in the spring, the young shoots are supposedly edible if prepared correctly. I have never tried to eat this plant but delight in looking at it… Pokeweed is native to our area, but sometimes has a tendency to grow profusely in places with bare soil and in some peoples’ gardens. Another autumn delight for the eye are these hairy fruit heads of virgin’s bower (Clematis virginiana), which is usually found in moist soil near streams or in swamps. These unusual fruiting capsules belong to a rare native plant called seedbox (Ludwigia alternifolia). 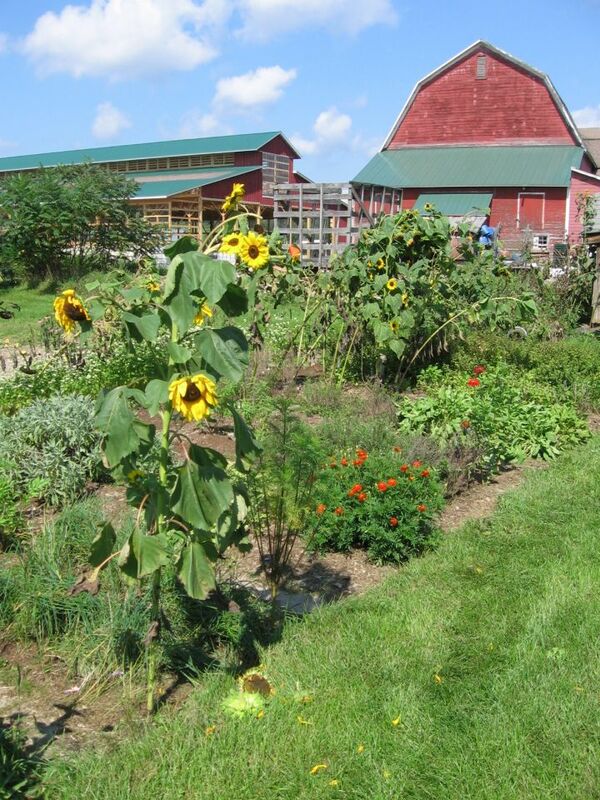 We have found this species in the wild only in two places, so far: on the “Solar Field” here at Hawthorne Valley, where it grows in a wet spot along the eastern fence line (see picture below) and on another farm in Kinderhook. 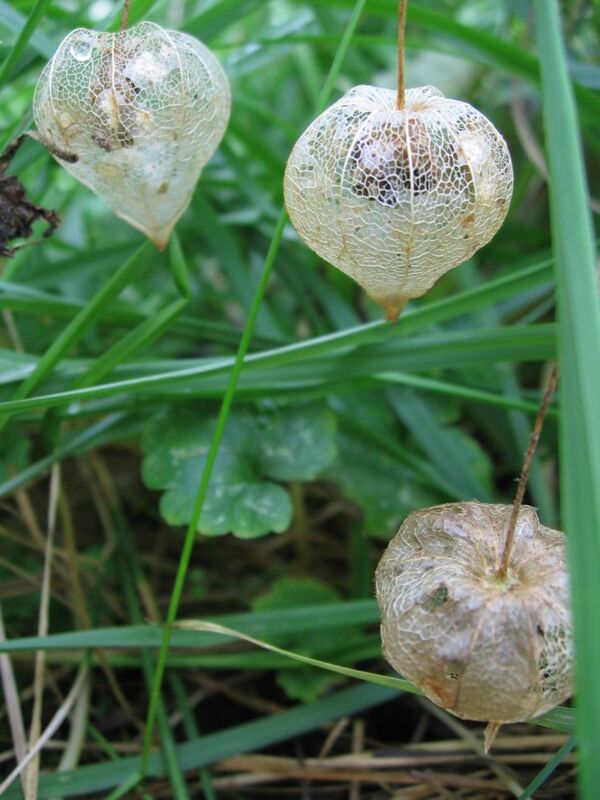 The seed capsules contain tiny seeds which readily germinate. Seedbox is now also thriving in the native plant garden at the Creekhouse. This is how seedbox looks from further away: the two reddish plants along the fence line. Autumn olive is originally from Asia and is considered an invasive plant because of its tendency to take over old fields, so you have to have no trepidations in harvesting as many berries as you can get your hands on. These red berries are found in the forest. 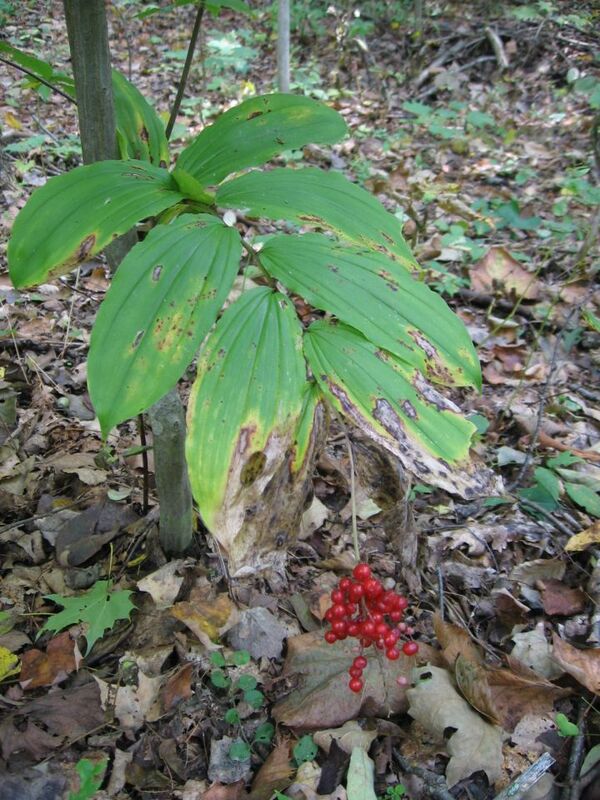 Another plant with red berries growing in our forests is Jack-in-the-Pulpit. 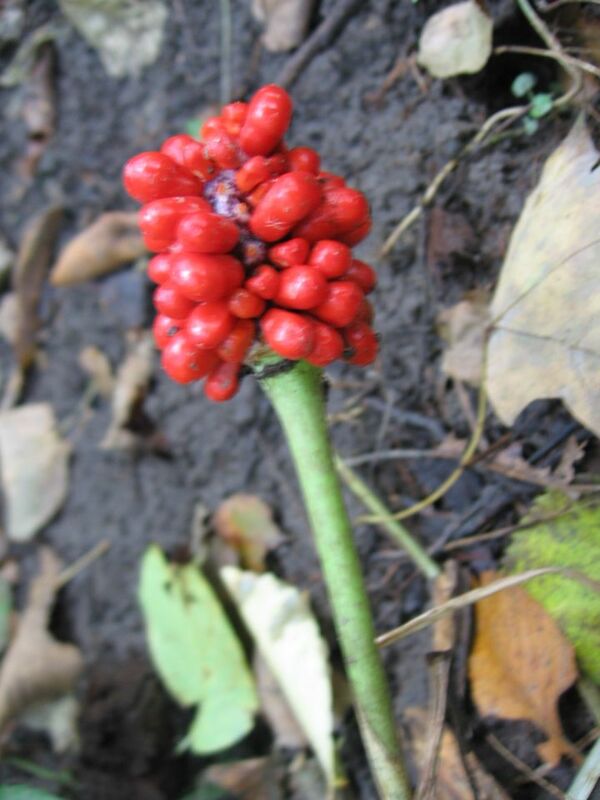 At this time of the year, the leaves and spathe/spadix (who originally surrounded the flowers and young fruits) have withered and the ripe berries are ready to be picked by birds and box turtles. 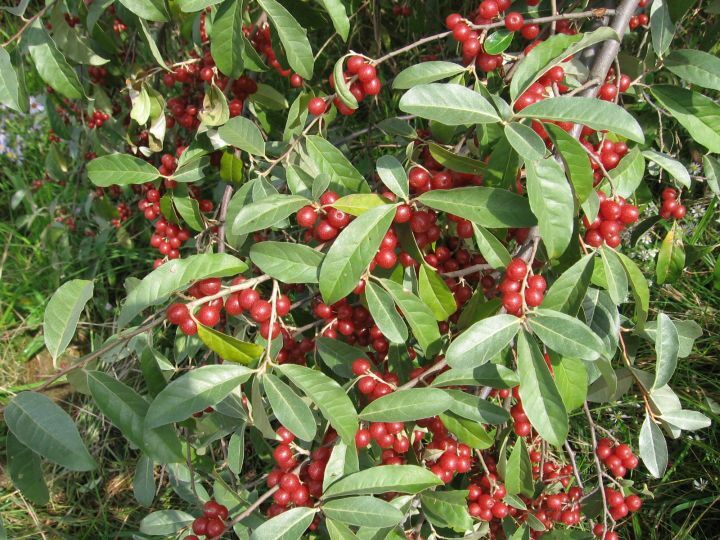 The berries are not edible for people, because they contain calcium oxalate. Not all fruits are red, at this time of the year! Now, we’ll slowly inch our way from fruits to flowers. 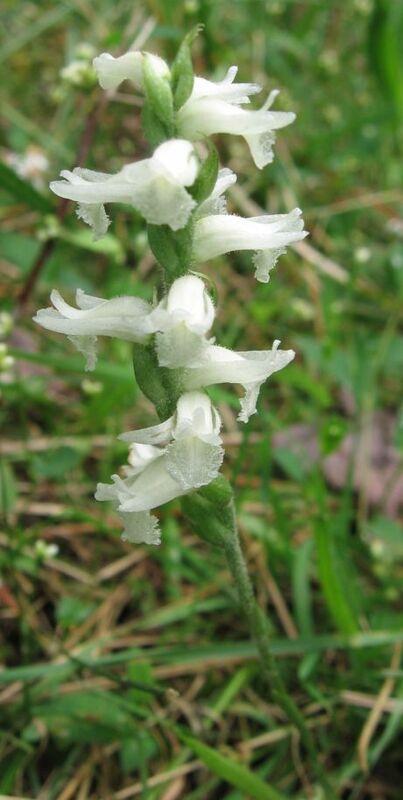 This lovely little orchid (around here, it is usually 4-6 inches tall) is called nodding ladies’ tresses (Spiranthes cernua) and is currently flowering in at least three different locations on the farm. 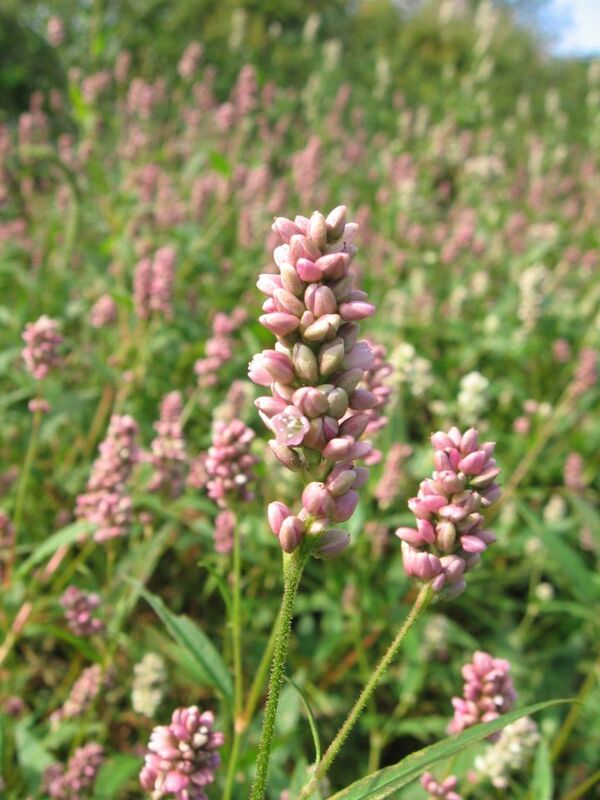 It likes wet meadows and seepy areas, but at each location there are only very few plants. 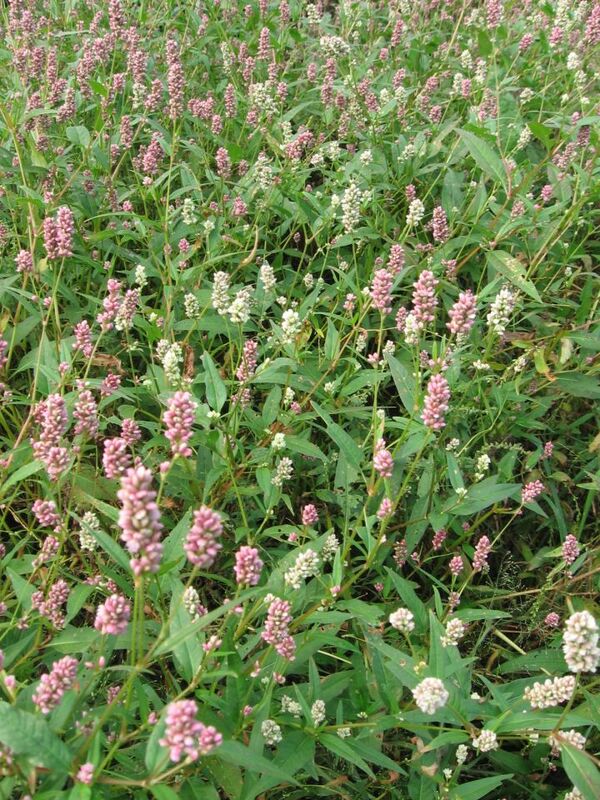 The exact opposite are several profusely growing smartweeds (Polygonum sp.). 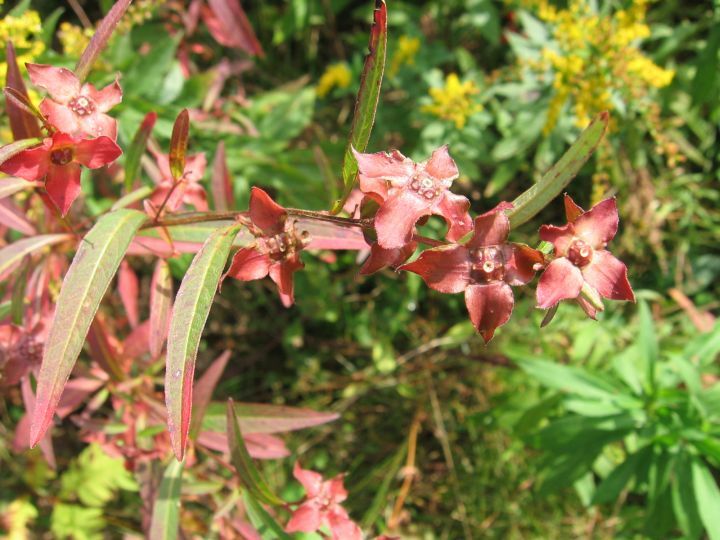 This species is the native Pennsylvania smartweed (Polygonum pensylvanicum). It is characterized by its dense flower heads of pink or white flowers and the conspicuous glands on the stem just below the flower heads. But other smartweed species grow nearby on the edge of the Beefield. 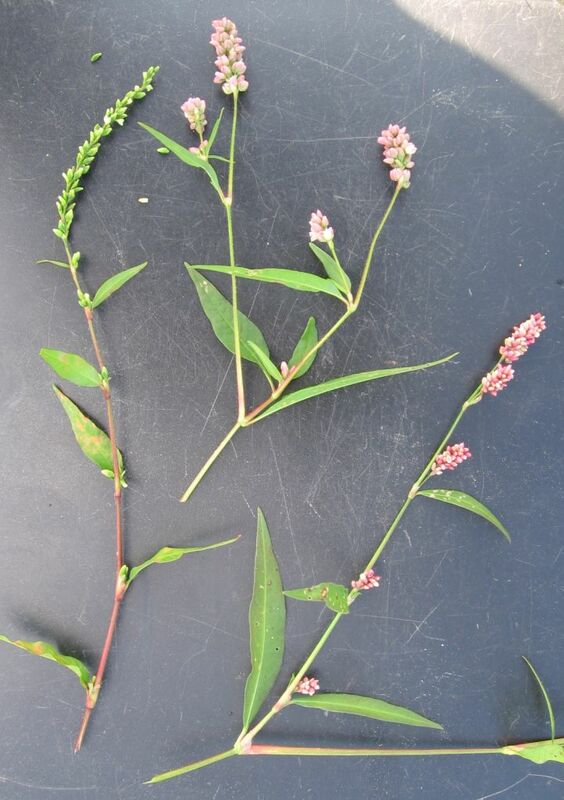 Left to right, you can compare the introduced waterpepper (Polygonum hydropiper), with narrow, elongate and nodding inflorescences of whitish flowers and leaves that are extremely peppery to the taste; the native Pennsylvania smartweed (P. pensylvanicum), with its glandular stems; and a third, yet unidentified, species with slightly smaller flowers and smooth stems. Annual fleabane (Erigeron annuus) is a native member of the aster family that begins flowering in May and can still be seen in full bloom at this time of the year along field edges and in extensively grazed pastures. To me, the biggest difference from the “true asters” is that the disk flowers of fleabane don’t seem to change color as they mature. Or at least one doesn’t get to see it, because the ray flowers turn from white to pink and fold themselves up to cover the maturing disk flowers (see bottom left flower head). 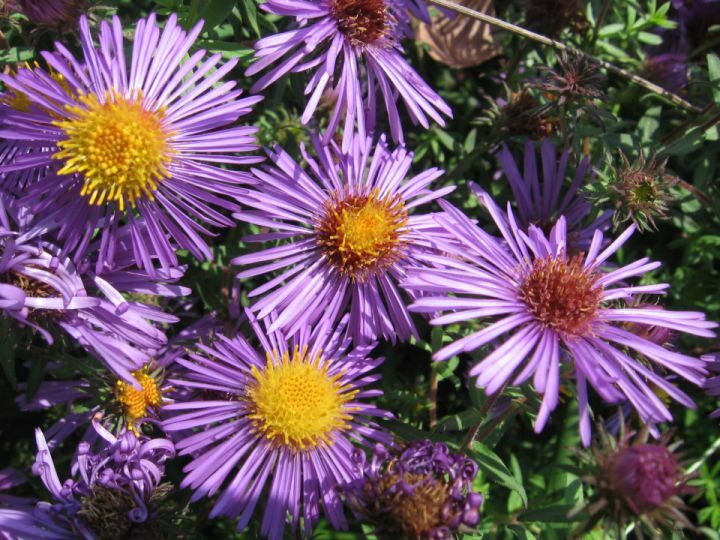 The color of the ray flowers in New England aster (Symphyotricum novae-angliae) does not change with time but is a characteristic to each plant. This picture shows a (rarer) pink and a (more common) purple form growing next to each other. 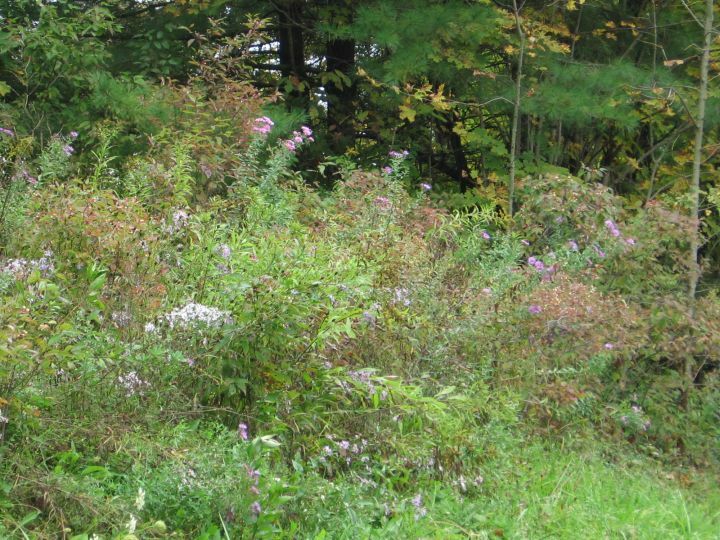 Where you see a clump of pink New England aster, you will likely see another clump next year. 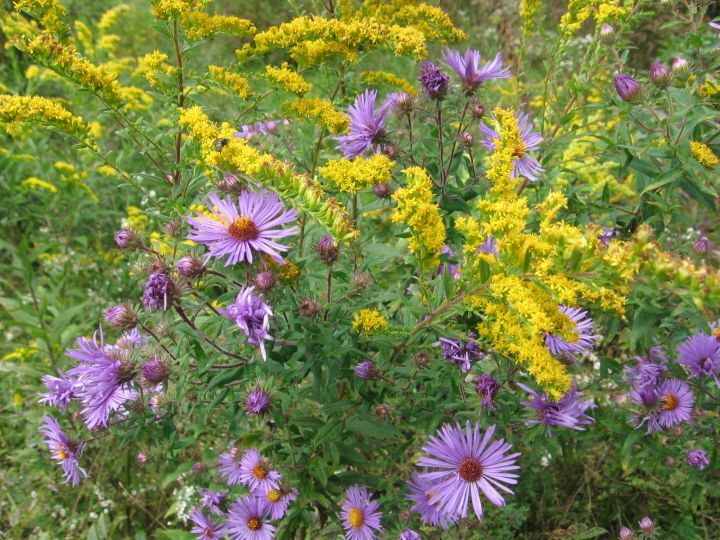 Purple-stemmed aster (lavender and whitish flowers on left) tends to occur in wetter places and usually has at least somewhat toothed leaves, while New England aster (purple flowers on right) tends to occur in dryer places and its leaves are never toothed. Both are rather hairy, can have purplish stems, and have sessile leaves with clasping leaf bases. Road banks are a great place to spot asters. 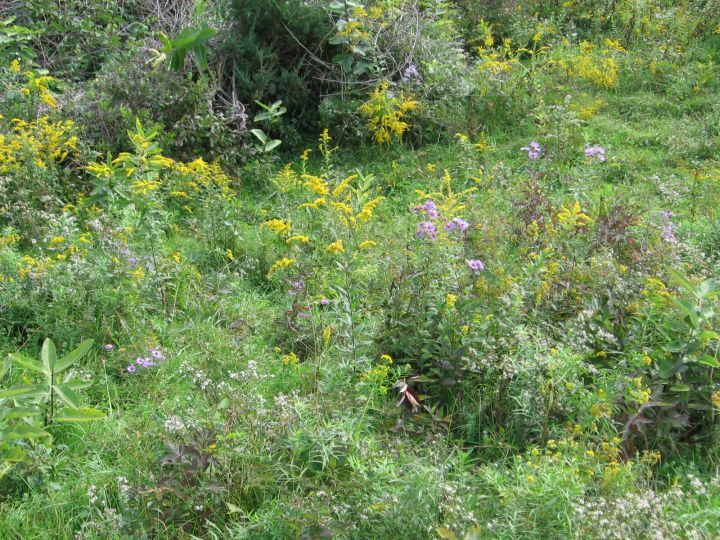 This site on Harlemville Road has at least five species growing next to each other. 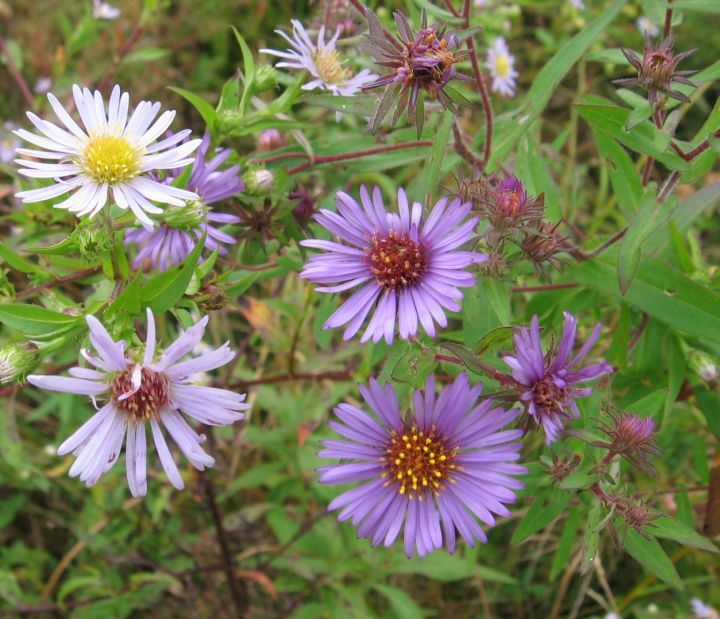 Smooth-leaved aster (Symphyotrichum laevis) has lavender ray flowers and the entire plant is super smooth, almost waxy. 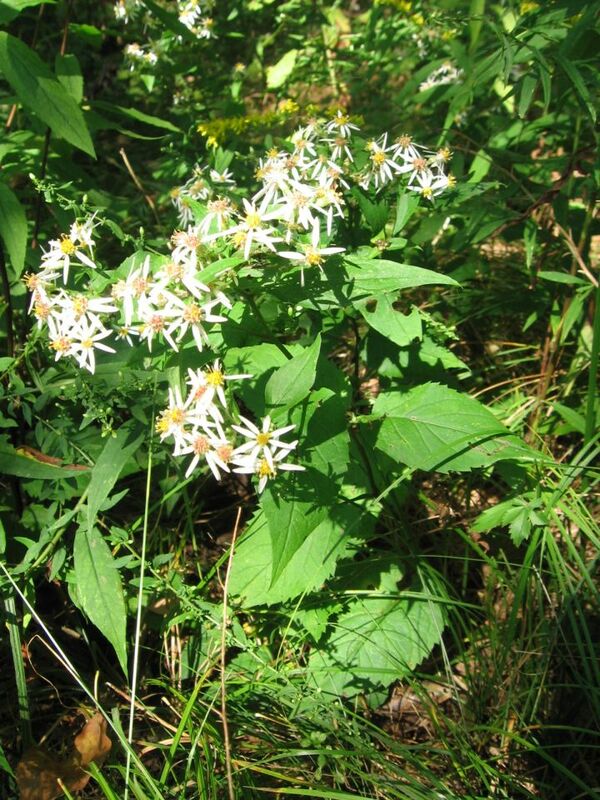 The leaves of smooth-leaved aster are narrow, sessile, and not at all toothed. 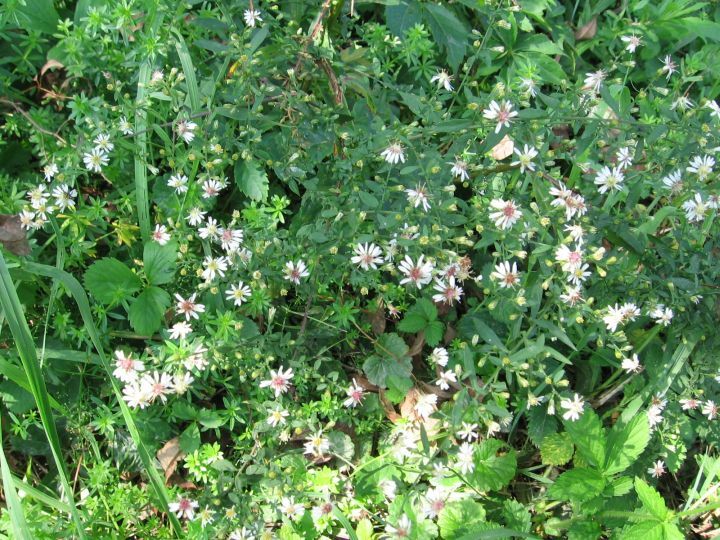 Right next to it, on the dry road bank, grows heart-leaved aster (Symphyotrichum cordifolium), which has a very similar ray flower color, but very different leaves. 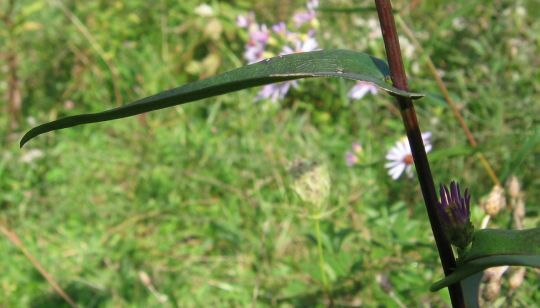 The leaves of heart-leaved aster are heart-shaped (at least the ones low on the plant), rough to the touch, strongly toothed, and have a long, sometimes slightly winged, petiole. Dry road banks are also a good place to spot wavy-leaved aster (Symphyotricum undulatum), another species with lavender ray flowers. The leaves of wavy-leaved aster can be hairy or smooth, toothed or not, but they always have a distinct winged petiole which clasps the stem in a characteristic way. Willowleaf aster (Symphyotricum praealtus) is another species that likes to grow in the open, often along field edges. It has ray flowers that are almost white with just a hint of lavender. 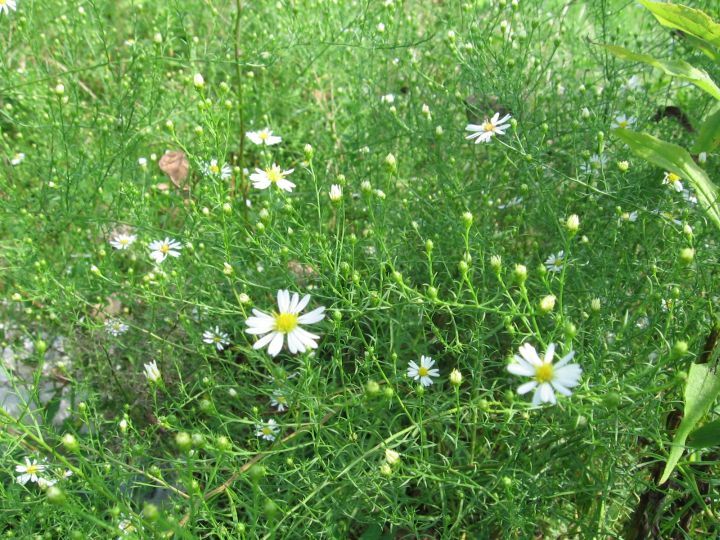 It is superficially very similar to panicled aster, but distinguished by its narrow, willow-like leaves. The leaves of willowleaf aster are never toothed (those of panicled aster usually have at least a few teeth) and have a characteristic, isodiametric network of secondary veins. This picture from near Ben Ocean’s bridge contrasts white wood aster (Eurybia divaricata) in the foreground with Schreber’s aster (Eurybia schreberi) in the back. 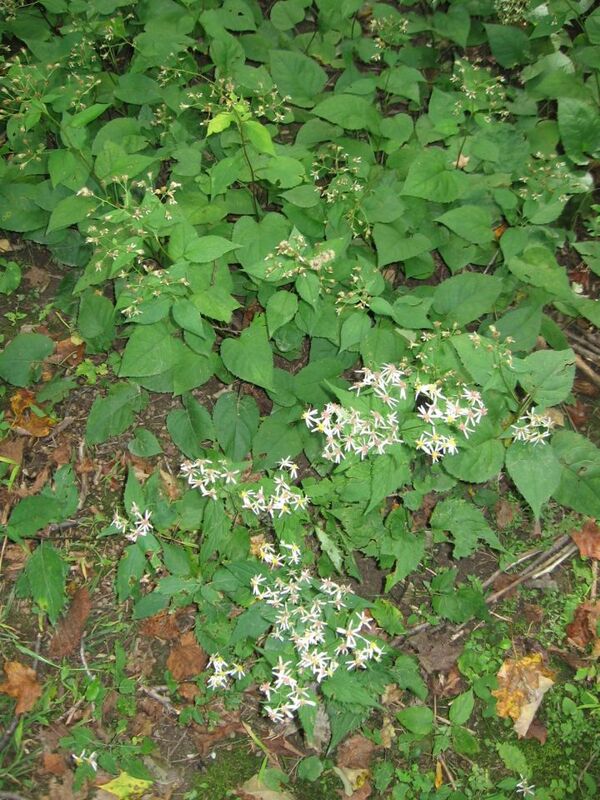 The almost ubiquitous white wood aster has narrower, more strongly toothed leaves and its flower heads tend to be arranged in a flat-topped inflorescence. 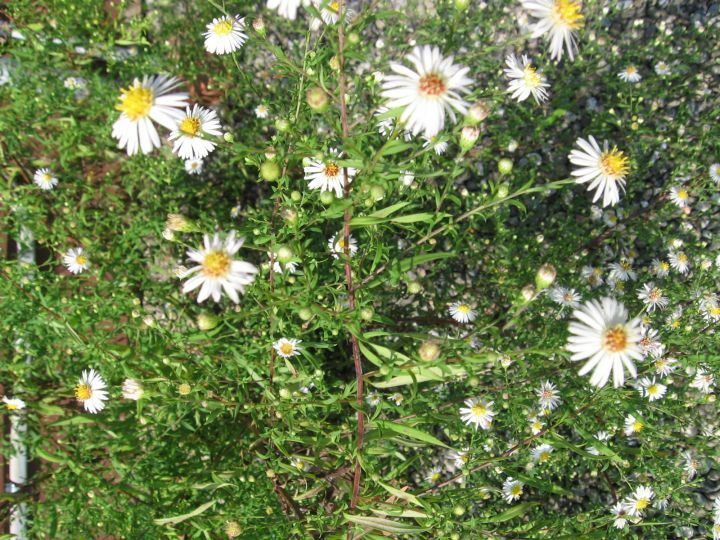 The rarer Schreber’s aster tends to have more elongate inflorescences, the leaves are broader and the colonies tend to be composed of flowering plants as well as a ground cover of basal leaves. 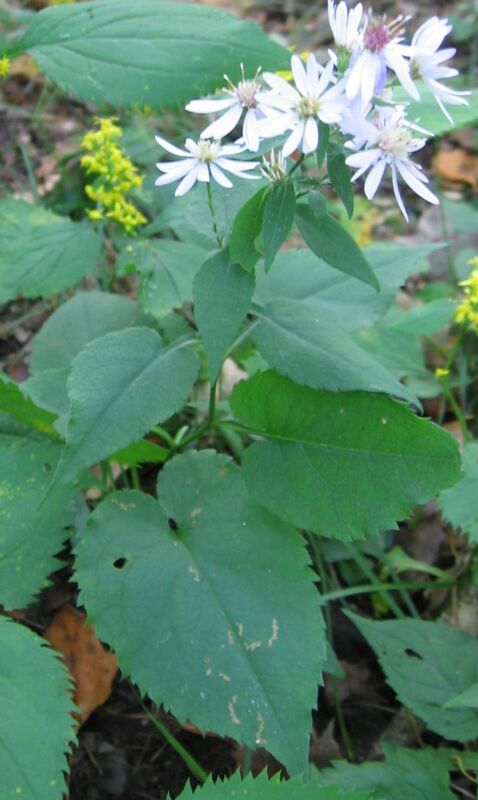 Another rarer woodland aster is large-leaved aster (Eurybia macrophylla). 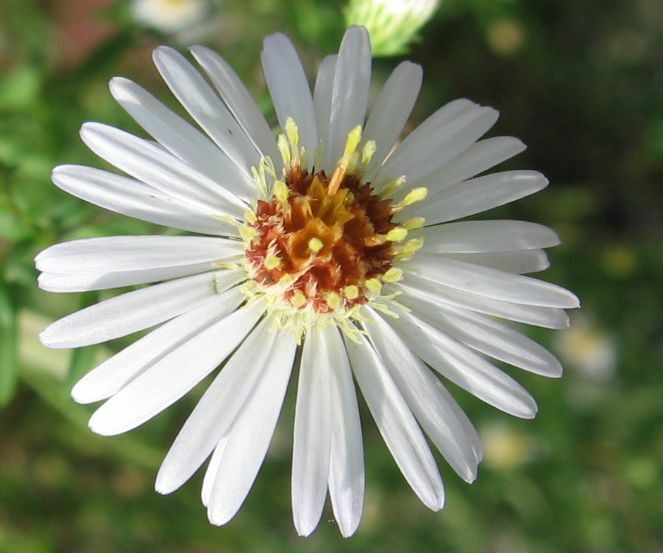 It is superficially very similar to Schreber’s aster, but the ray flowers tend to have a lavender tinge and a magnifying glass reveals tiny glands that cover the stems near the inflorescence. 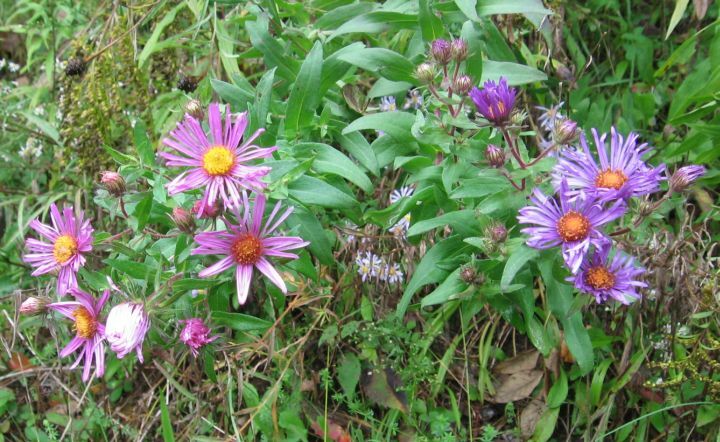 A patch of this aster grows west of the Baba Yaga house at the base of Phudd Hill. 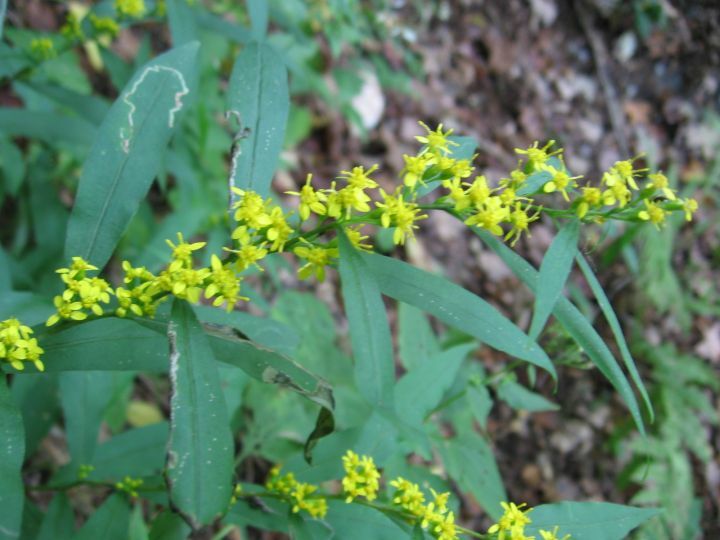 Zig-zag goldenrod (Solidago flexicaulis) has broad leaves and a stem that tends to zig zag from one leaf to the next. It prefers the deep alluvial soil near Ben Ocean’s bridge. 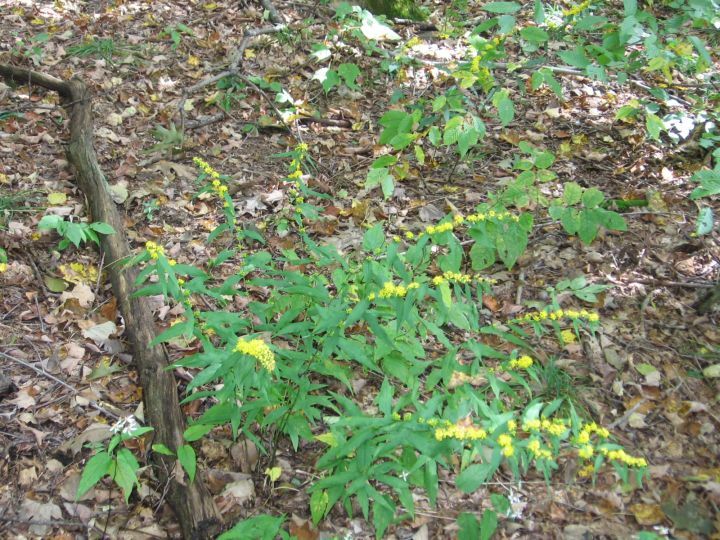 The flowers of zig-zag goldenrod are not arranged at the top of the stalk and above the leaves, like in most other goldenrods, but grow from the axils of the leaves, thus alternating with the leaves along the stalk. 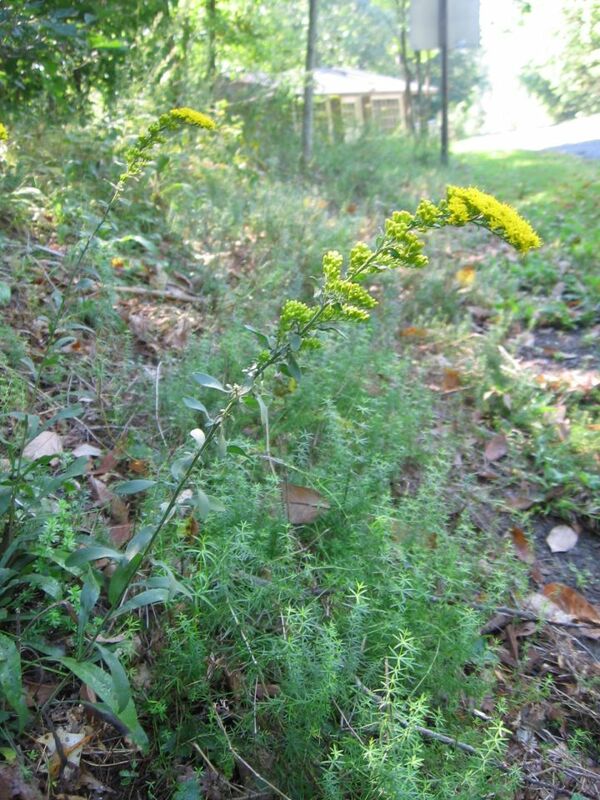 Bluestem goldenrod (Solidago caesia) grows in slightly dryer, but also shaded habitat. Some nice patches can be observed on the trail to the swim pond. Bluestem goldenrod also alternates flower clusters and leaves. The leaves are long and narrow, the extremely smooth stem is sometimes bluish/purplish-colored and often has a waxy cover that can easily be wiped off. We have reached the peak of fall flower season and Hawthorne Valley is ablaze with the blossoms of a large variety of wild and cultivated plants, many of them representatives of a diverse plant family that is sometimes called the Aster family. Aster is an ancient Greek word (ἀστήρ) meaning “star” and refers to the typically star-shaped flower arrangement in this plant family. The usually quite small flowers are arranged in flower heads, often composed of a central disk of one type of flower (disk flowers), surrounded by a ring of another type of flower (ray flowers) which form petals radiating out from the central disk like the rays of a star. 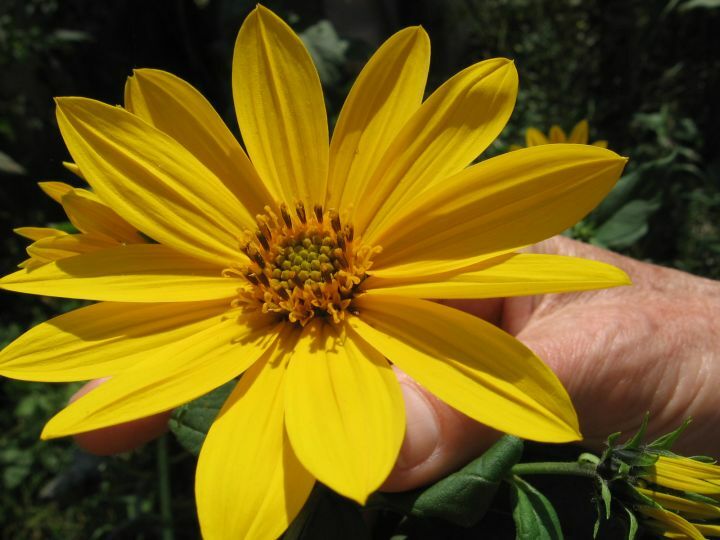 This unique, composite flower arrangement is referred to in another name for this plant family, the Compositae. 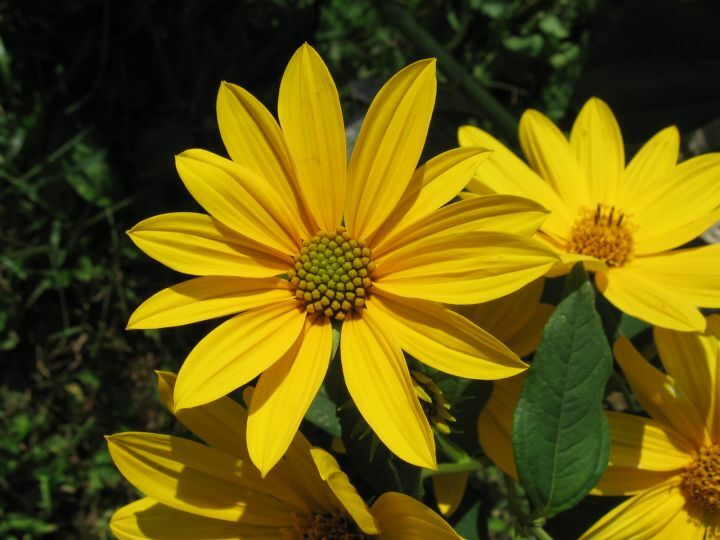 The flower head of Jerusalem-artichoke (Helianthus tuberosus) illustrates the basic architecture of a composite flower head. The disk flowers in the center of the flower head in the foreground of this picture are still in bud and their 5 tiny petals have not yet unfolded. The ray flowers, located on the perimeter of the central disk, each developed only one of their petals (4 rudimentary petal lobes are often still visible upon close examination) and these petals are huge in proportion to the tiny ray flowers. As a result, the overall impression of this composit flower head is that of a single flower. This flower head is a bit more mature, the disk flowers are beginning to open around the perimeter. Each tiny disk flower has 5 petals (or corolla lobes). From their center emerges a dark column which is formed by the fused pollen-bearing parts, the anthers. Through the inside of this column emerges the stigma which pushes the pollen out of the hollow anther column just like a bottle brush would clean out a bottle. 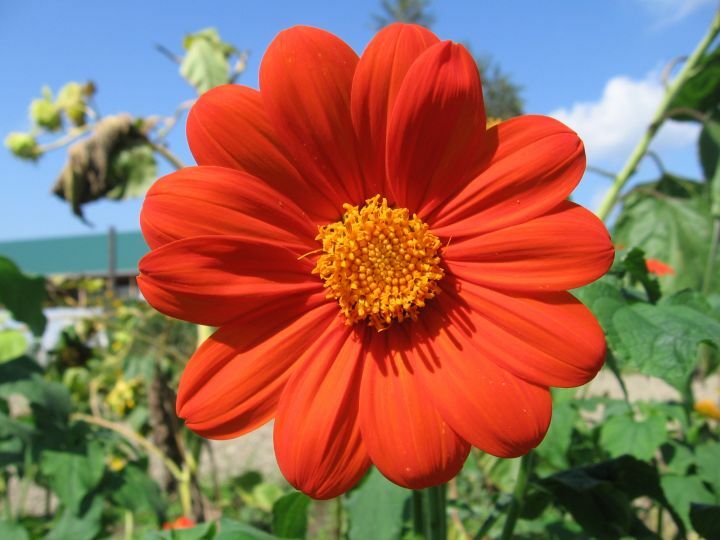 Once the stigma of a disk flower has risen above its anther column and freed the pollen, it unfolds into two curly parts that are now ready to receive pollen from another flower. All of the disk flowers of this flower head have opened and most have already dispersed their pollen and dropped the remains of the anther column, but the curly stigmas remain. Only five disk flowers at the very center still have the dark anther columns. Flower heads at different stages of maturity are often found on a single plant and make it fun to have a really close look to see what is going on in each one of them. Jerusalem-artichoke often grows in big stands. This one is near the greenhouse at Hawthorne Valley, but they are also found along the edge of the store parking lot, and in a patch near the bridge on Route 21C. 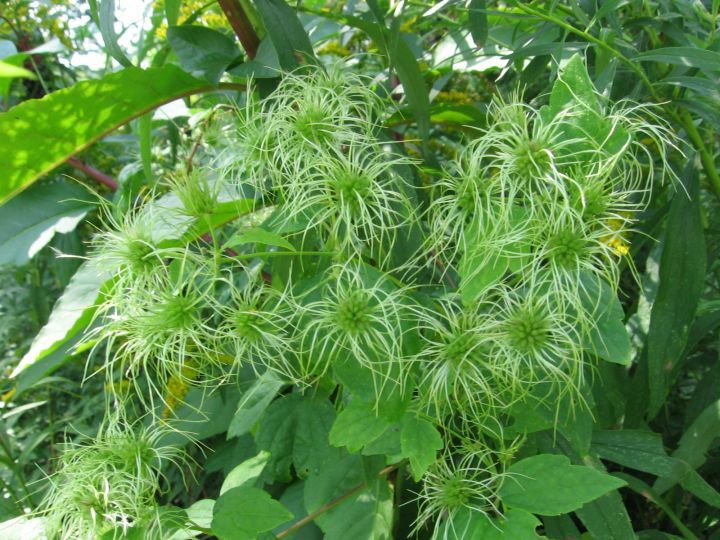 There is no doubt that they are native to North America, but since they have been cultivated by Native Americans before the arrival of Europeans, their exact native range is somewhat obscure. 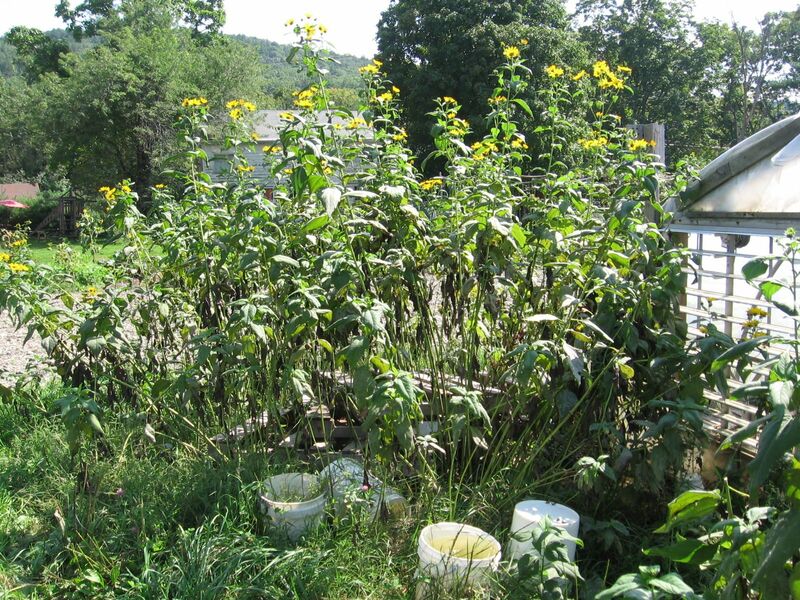 In Columbia County, we find Jerusalem-artichoke never far from houses or gardens. Its edible tubers contain inulin instead of starch, which provides certain health benefits. 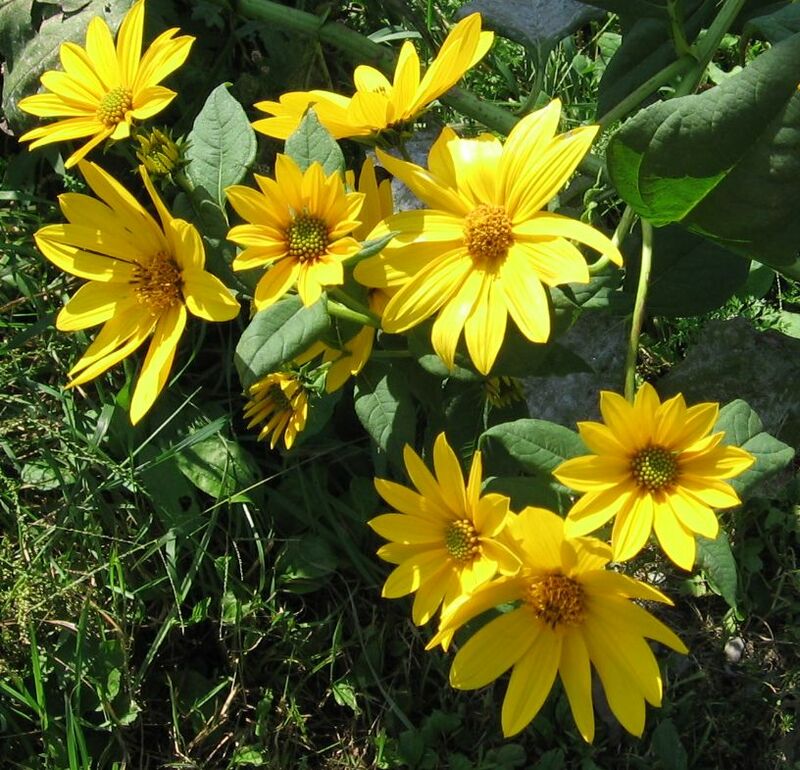 The Common Sunflower (Helianthus annuus) of our gardens is a cultivar of a sunflower species native to North America, that has been cultivated for its oily seeds by Native Americans for milenia and, like Jerusalem-artichoke, does not grow wild in Columbia County. These beauties thrive in the garden of the Visiting Student’s Program. Behind them you see the newly constructed loafing barn which will soon become the comfortable winter home of Hawthorne Valley’s dairy herd. 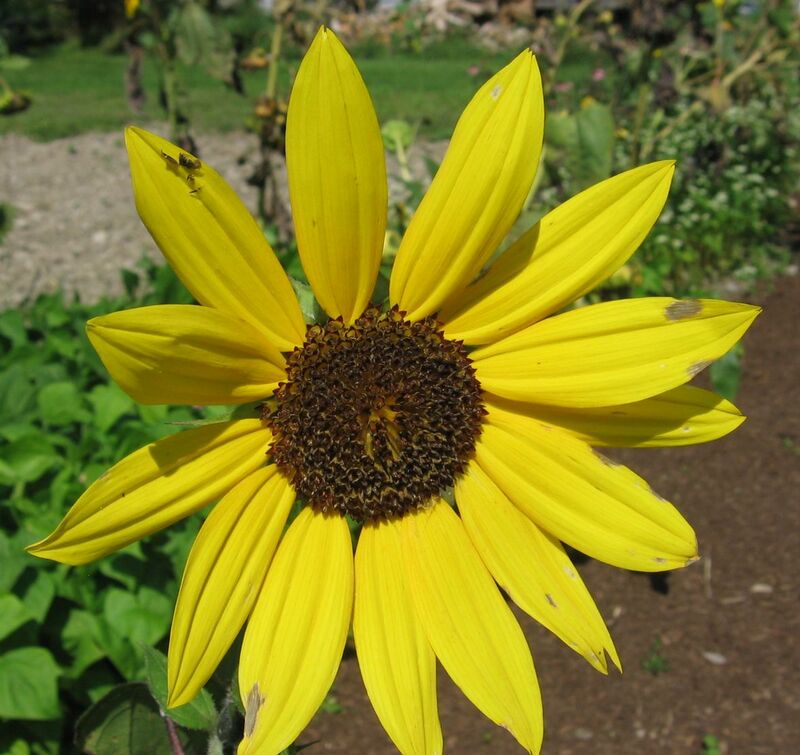 Obviously, the Common Sunflower is another beautiful example of a typical composite “flower”. Have a close look and where you are expecting to see the seeds a few weeks from now, you’ll be able (even without a magnifying glass) to distinguish the many small disk flowers with their five tiny petal lobes. If you begin to look around any garden at this time of the year, you will certainly find several variations to the theme of the “typical composite flower”. 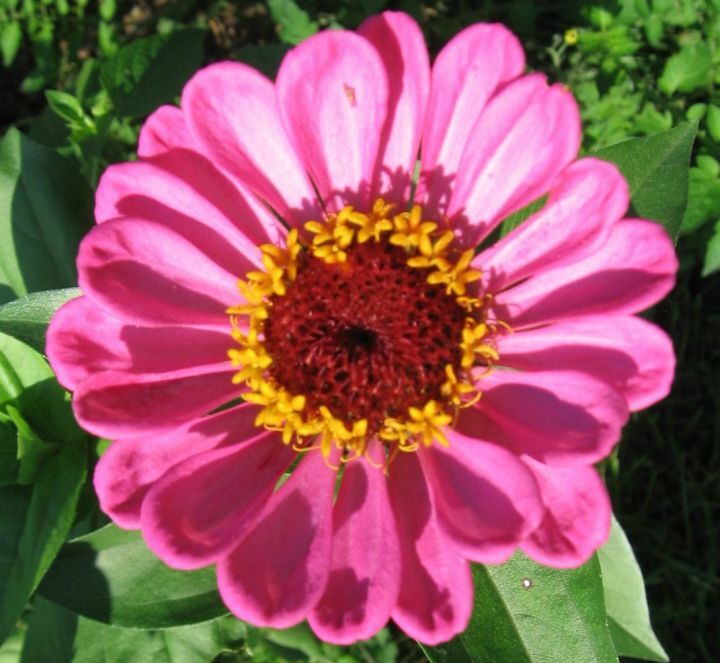 Zinnias and Chrysanthemums (Mums) have been bred to many varieties by selecting for flower heads with multiple circles of ray flowers and/or more showy disk flowers. Zinnia with a “classic” flower head. Zinnia with showy disk flowers. 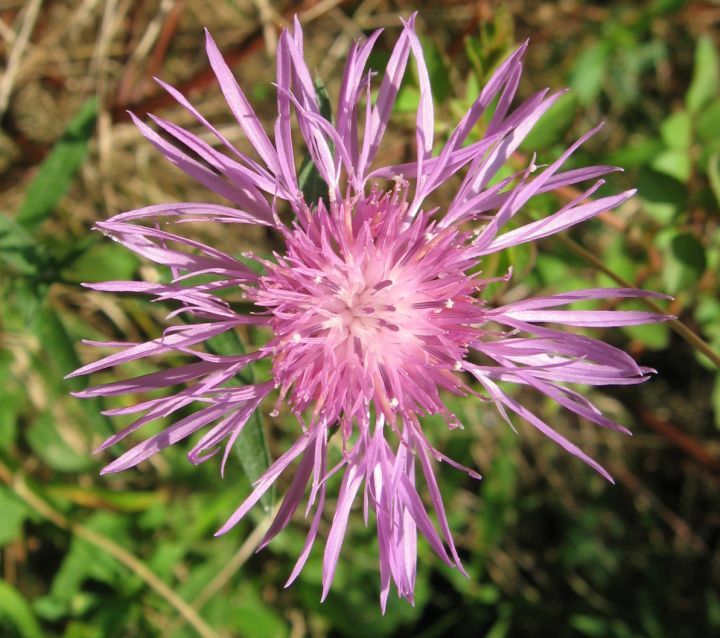 Knapweed (Centaurea sp.) has disk and ray flowers of the same color. 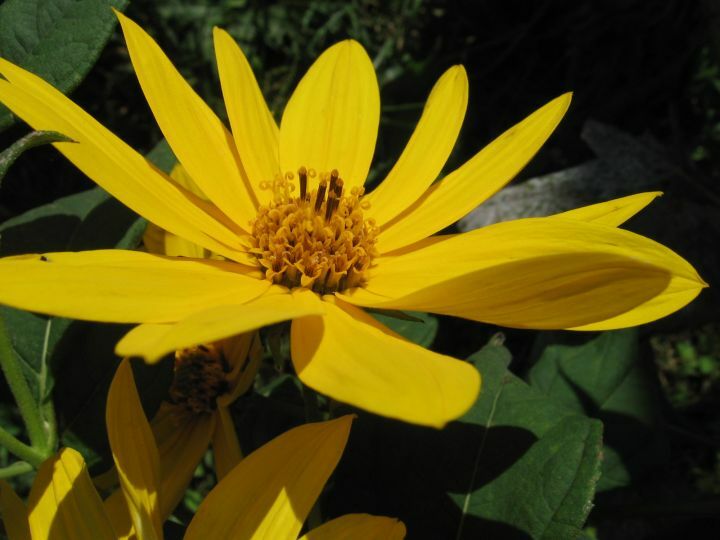 The ray flowers tend to not produce pollen or seeds, but do develop all five petals. 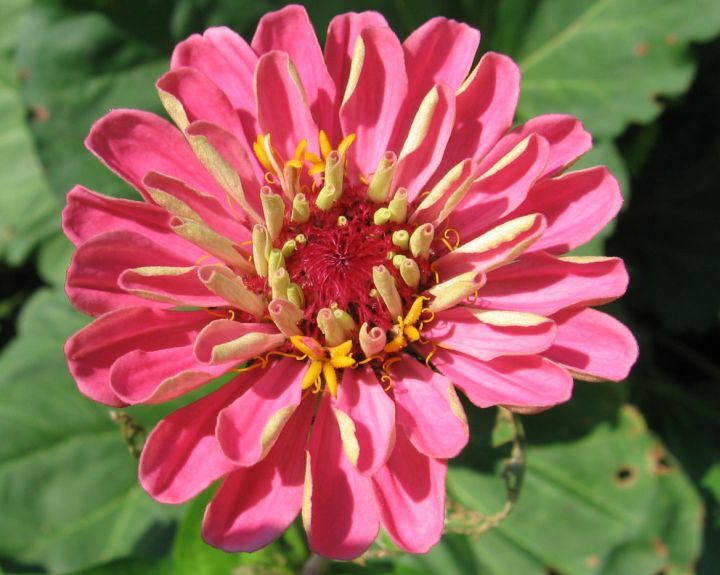 The petals facing the outside of the flower head are longer than the others. 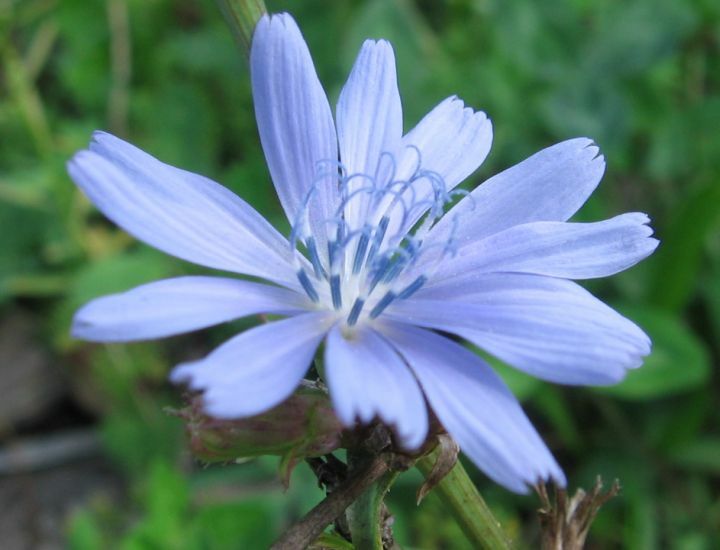 The flower head of Chicory (Cichorium intybus) is composed exclusively of fertile ray flowers. Note how the original five-ness of each flower is still expressed in five lobes at the tip of the remaining single petals. Chicory is the common road-side weed that brings a heavenly blue hue to the landscape by mid summer and continues flowering into the fall. It’s roots can be roasted and ground for a coffee substitute. One of my personal favorites among the native fall flowers is New England Aster (Aster novae-angliae, recently renamed to Symphyotrichum novae-angliae) which is around here often also called Michaelmas Aster. 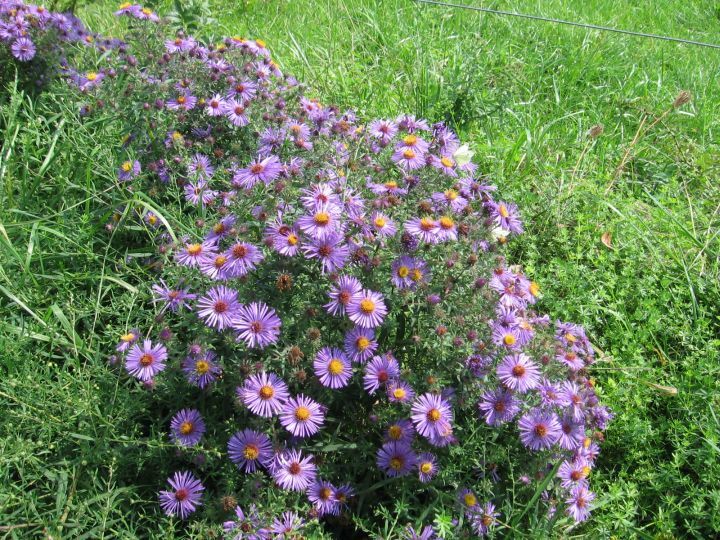 It tends to have the largest flower heads and the darkest purple color of the native aster species and grows along road sides and field edges. 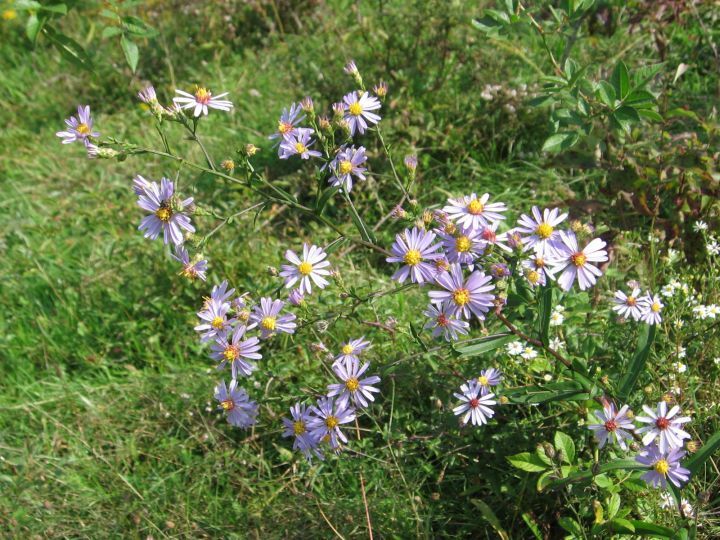 The very similar Purple-stemmed Aster (Aster or Symphyotrichum puniceum), not depicted here, tends to have slightly paler rays and prefers somewhat wetter locations. In the wet meadows west and north of the former Banjo Mountain Cafe, both species can be observed growing next to each other. 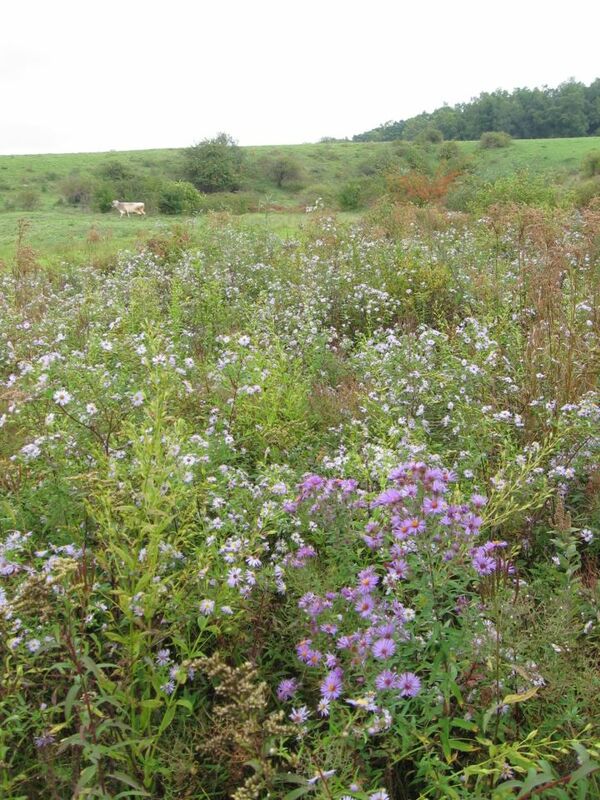 In past years, a pink variation of New England Aster was growing by the roadside west of Route 21C just outside of Harlemville on the way to Philmont. Will it be here again, this year? In New England Aster, like most other native asters, the young disk flowers are bright yellow. Once they have been pollinated and the seeds begin to develop, the disks turn purple. Flower heads at different stages of maturity are often found next to each other on the same plant. 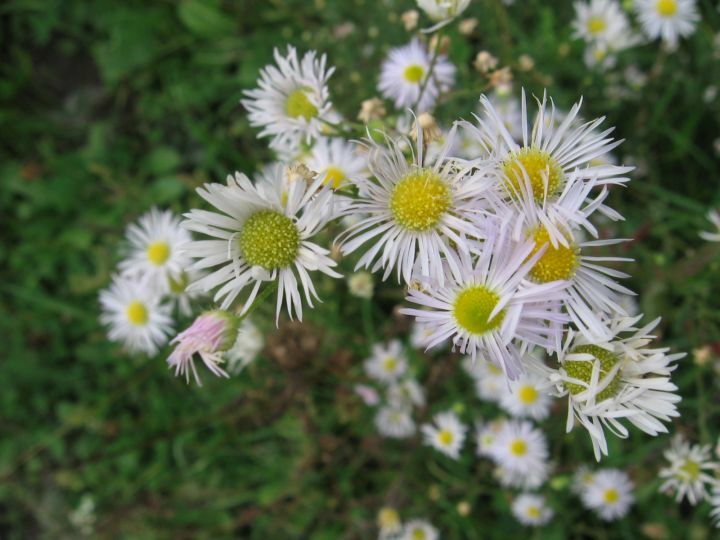 Three white-flowered wild asters are commonly found along field edges and in meadows at Hawthorne Valley. White Panicle or Eastern Lined Aster (Aster lanceolatus or Symphyotrichum lanceolatum) tends to be the largest, with the largest flowers and leaves of the three. Panicle Aster has 20-40 rays which can be up to 1/2 inch long, but are often much shorter. The young disk flowers are yellow. The disk flowers of Panicle Aster turn darker as they mature. 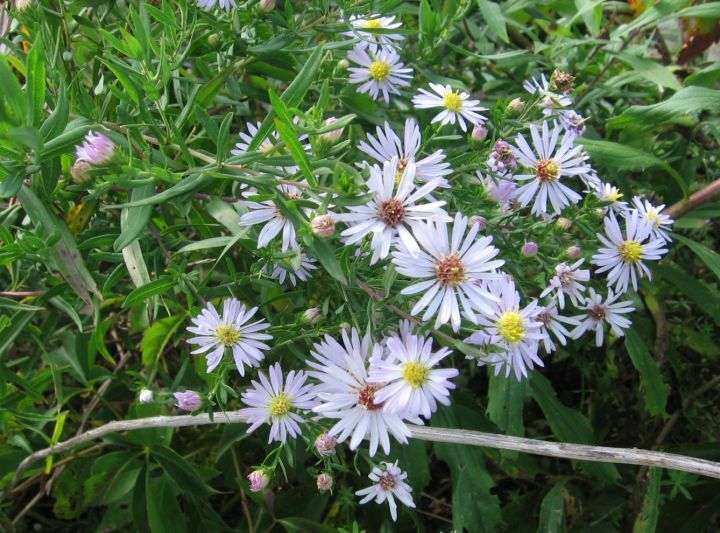 The second common white meadow aster is Goblet or Calico Aster (Aster lateriflorus or Symphyotrichum lateriflorum), which is very similar to Panicle Aster but tends to have smaller flowers and leaves. It only has 9-15 rays which usually don’t exceed 1/4 inch. 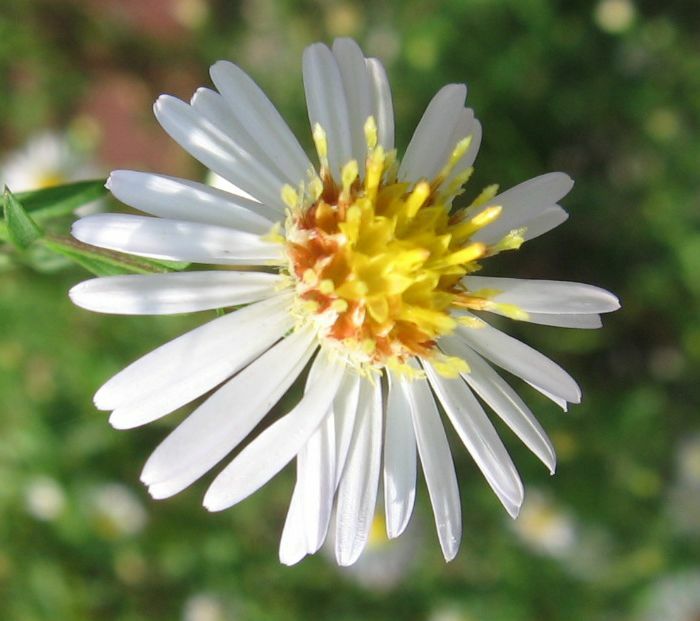 The third common white meadow aster is Awl-aster (Aster pilosus or Symphyotrichum pilosum), which is easily recognized by its needle-like leaves. These are just some example of the more common and conspicuous meadow asters, there are several more related species growing in our meadows and forests. 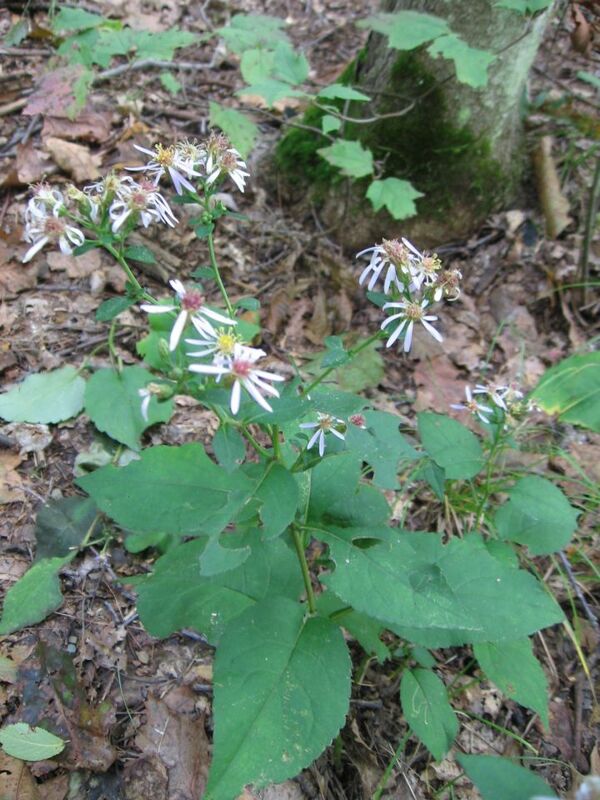 The broad-leaved White Wood Aster (Aster divaricatus or Eurybia divaricata) is the most common woodland aster in the valley and can be observed on the trail behind the school along the Agawamuck. 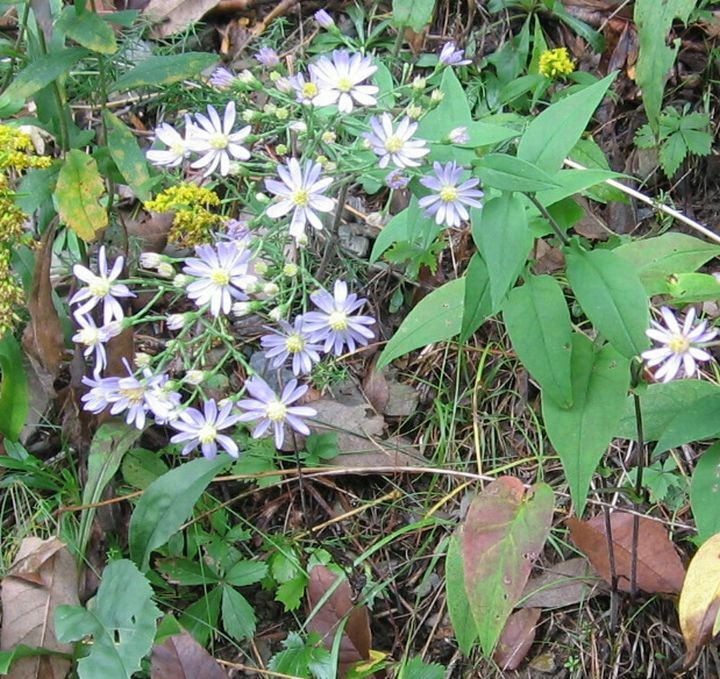 Other broad-leaved woodland asters found there, but not depicted here, are Heart-leaved or Blue Wood Aster (Aster cordifolius or Symphyotrichum cordifolium) and Schreber’s Aster (Aster or Eurybia schreberi). This so very familiar sight is the most common of our “oldfield” goldenrods, Canada Goldenrod (Solidago canadensis), which grows copiously at Hawthorne Valley along roadsides and field edges. Goldenrods belong into the Aster family and, upon closer inspection, all these tiny yellow flowers organize themselves into small, composite flower heads. Each flower head of a goldenrod is composed of a few yellow disk flowers (which produce pollen and can develop seeds), surrounded by usually also yellow ray flowers (which don’t produce pollen, but can make seeds). 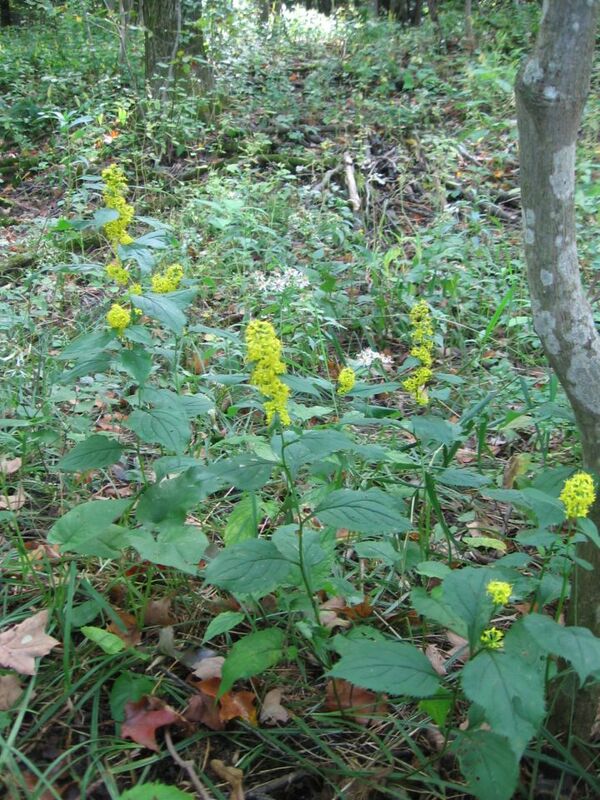 However, Canada Goldenrod is not the only “old field” goldenrod. 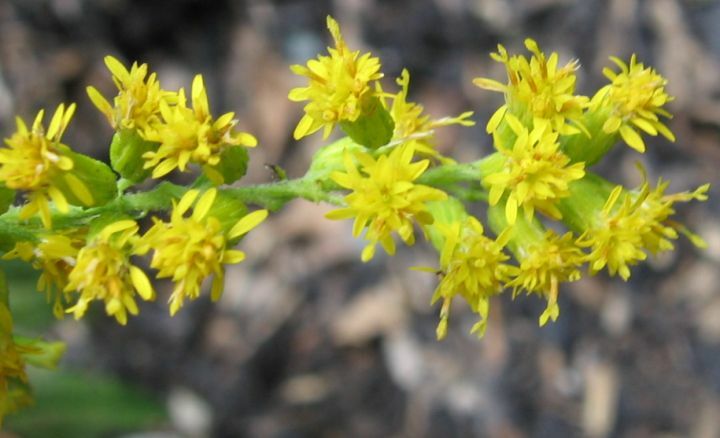 Depicted here is another common “old field” species, Wrinkle-leaved or Rough-stemmed Goldenrod (Solidago rugosa), easily recognized by its unusually broad and wrinkely leaves. Not depicted here are Grass-leaved or Flat-topped Goldenrod (Solidago or Euthamia graminifolia) and Smooth or Giant Goldenrod (Solidago gigantea). The latter tends to occur in somewhat moister soil than the others, but all four species are often found growing together. These four most common “old field” species tend to be responsible for the bulk of yellow seen all throughout the County in unmowed meadows and along roadsides and field edges at this time of the year. They provide nectar and pollen to a large range of insects. 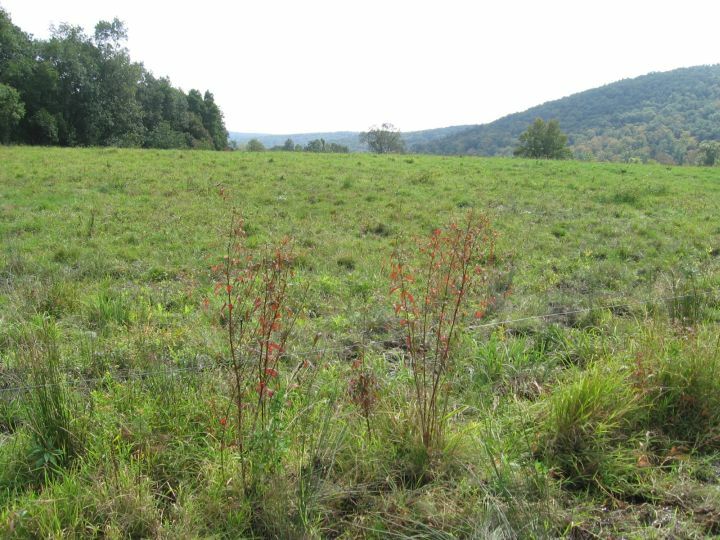 The Grey or Old Field Goldenrod (Solidago nemoralis) is not as common and does not grow in such dense colonies as the above mentioned species and seems not to be able to compete with them where the soils are deep and fertile. 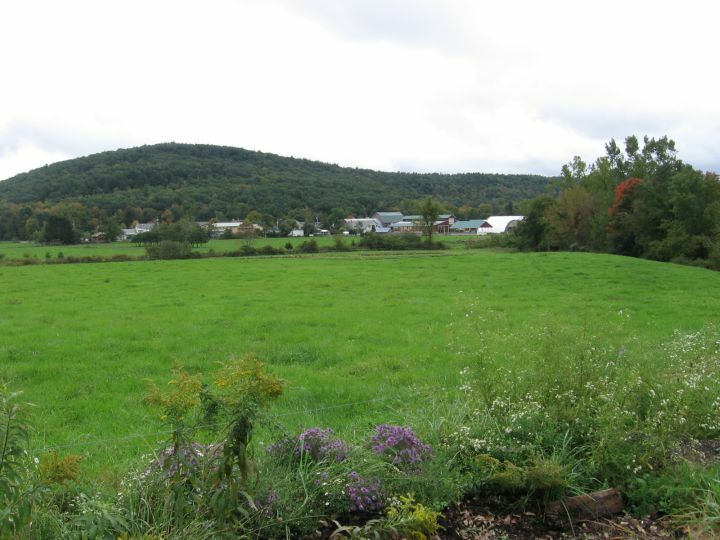 It is found at Hawthorne Valley here and there on pastures with poor, thin soil, but can also conveniently be observed from the car along the bank of the road at the stop sign where Harlemville Road meets the Taconic Parkway (coming from Hawthorne Valley). 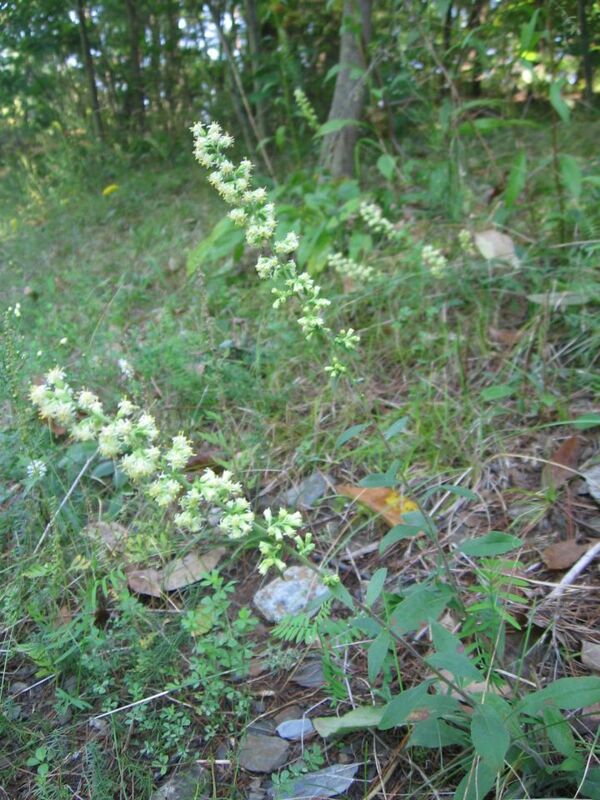 An exception among the goldenrods is this white-flowering species, which is aptly called Silverrod (Solidago bicolor). 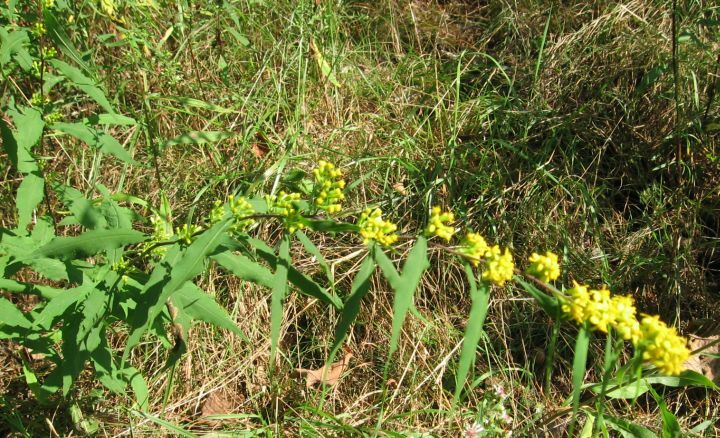 It occurs in similar situations as the Grey Goldenrod, on pastures with thin soil, often a bit closer to the forest edge and sometimes even in open forest. It can also be observed from the car at the bank of Harlemville Road near the stop sign at the Taconic Parkway. Finally, not many people are aware of the fact that goldenrods don’t only grow in open sun. 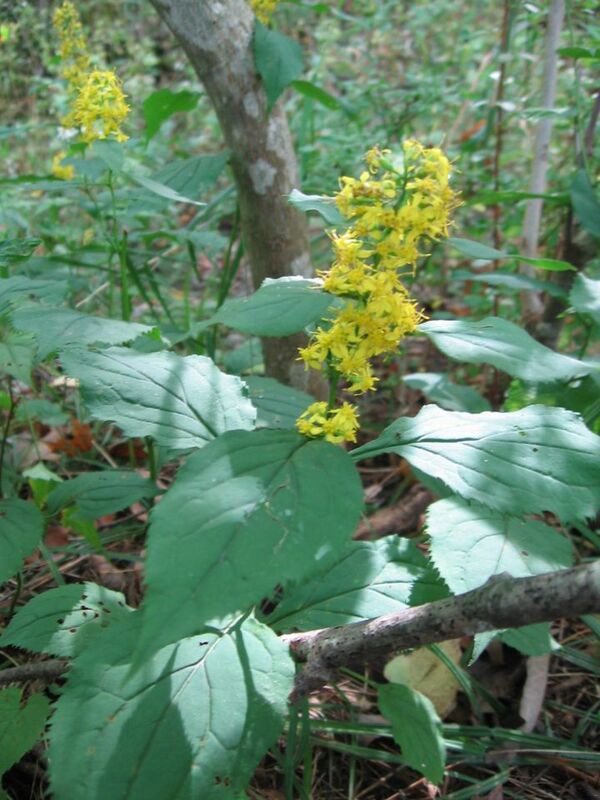 There are a few species of forest goldenrods that thrive under a closed canopy and are hardly ever found in the open. 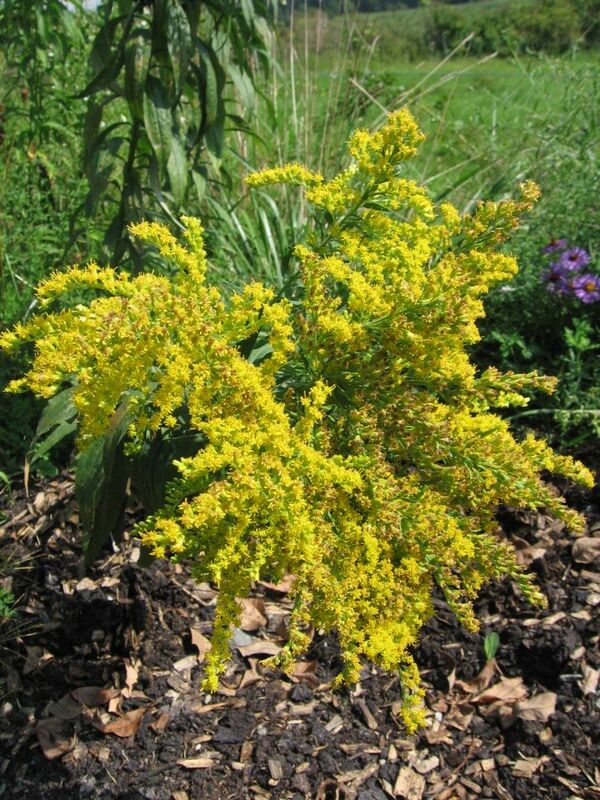 The here depicted Blue-stemmed Goldenrod (Solidago caesia) is one of them. Note the purplish color of the stem and how the flowers are arranged in the leaf axils all along the stem. 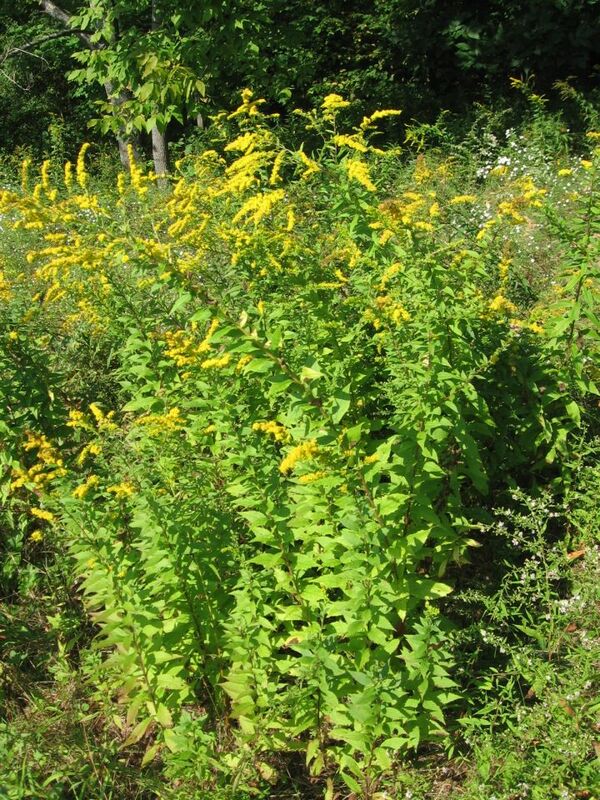 This species can be seen from the path along the Agawamuck behind the school, where it grows together with Zig-zag Goldenrod (Solidago flexicaulis) and Forest or Cutleaf Goldenrod (Solidago arguta).